Choosing the right fencing material can be a tough decision. But if you want a low-maintenance, durable fence that will stand up to the wildest weather patterns all year, Freedom Fence and Home recommends a vinyl fence. Vinyl fence is a low-maintenance option that will stand up to any weather conditions. Freedom Fence and Home recommends vinyl fence for any place with a wide range of weather. Vinyl fencing can stand up to extreme moisture and temperature changes. 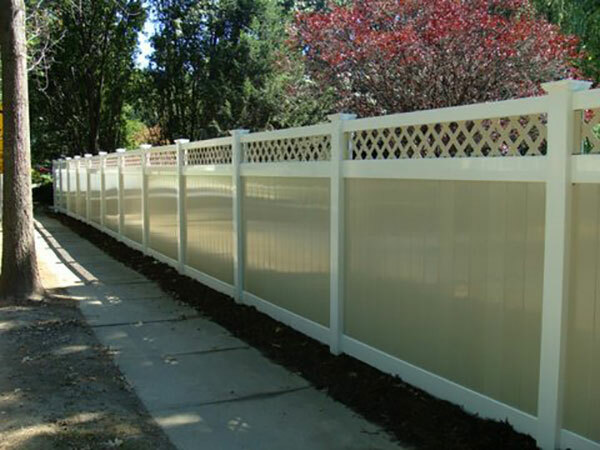 No matter how hot or wet it gets, you’ll be satisfied by your vinyl fencing. And unlike wood, your vinyl fencing won’t shrink in the cold or swell in the heat. Vinyl fencing is virtually maintenance-free. Unlike other fencing materials, which may require complicated cleaning, staining, painting, sealing or other work, vinyl fencing only requires a simple bleach-and-water solution to clean up. Why give yourself more work to do, when vinyl fencing stays stronger, longer? Vinyl fencing adds curb appeal to your home, and will increase your home’s value when you decide to sell. Vinyl fencing gives your property a nice finish — you’ll be positively glowing when you see your lawn with your new vinyl fence. With 50 years of experience, Freedom Fence and Home uses only the highest quality vinyl, with superior thickness and aluminum reinforcement in the bottom rail to ensure your fence will never sag. Best of all, we do not use subcontractors and stand behind our work. If you have any questions about how a Vinyl Fence can help boost the value of your Baltimore Home, please contact Freedom Fence and Home by calling 443-271-6841 or visit our website. You can also follow us on Facebook and Twitter! This entry was posted on Friday, April 1st, 2016	at 2:07 pm	. Both comments and pings are currently closed.